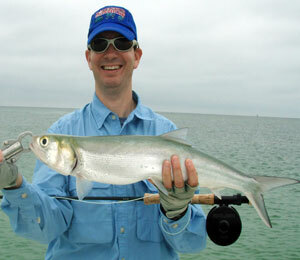 Lady Fish are known as the “Poor Man’s Tarpon”. 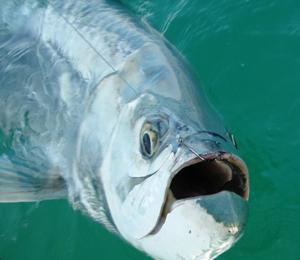 They have a few similarities to the tarpon but are less exaggerated and smaller. They have a slender body with small scales that come off very easily. Their last dorsal ray is slightly elongated on a single dorsal fin. They have no teeth and a slightly pointed head. The Florida record is 4 pounds and 10 ounces. 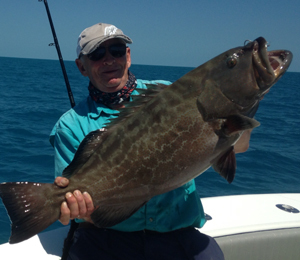 Lady fish are available November through April in the Lower Florida Keys an Key West. The Lady Fish is an inshore fish and is found in bays, basins, and estuaries. They are usually found in schools and thrash schools of bait. Key West Fishing Charters catch Lady Fish with the same techniques as Spotted Sea Trout fishing. The guide usually drifts across grassy bottom basins in the backcountry. The fish are very acrobatic and once hooked stay in the air more than the water. Ultra light spinning tackle with 6 pound test and a 7 foot fast action rod. Small jigs, crank baits, and lures work well. They are not very finicky, but hit like thunder.